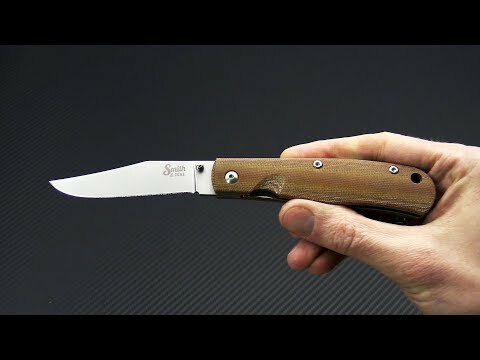 The Cypress Trapper is a new liner lock folder from Smith & Sons made with precision by Maserin Cutlery in Maniago, Italy. The Bald Cypress is the legendary tree from the Louisiana swamps prized for its ability to weather most anything which is personified in the Smith & Sons Cypress Trapper. It has the class, feel, and attention to detail you’d expect from a classic Trapper with modern amenities and functionality such as one-handed operation, liner lock construction and pocket clip carry. This version comes with a D2 Tool Steel blade and Natural Canvas Micarta handle scales. Handle: Contoured, durable Natural Canvas Micarta handle scales have been attached to steel liners with stainless steel Torx hardware. The Micarta is contoured for a comfortable feel in-hand while the design offers good security and control in the hand. The pommel end of the handle curves downward to offer enhanced control and a generous hole is provided for lanyard attachment.